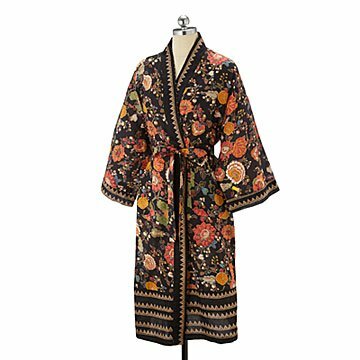 An exquisite garden of lush, hand screen-printed flowers looks vividly alive on this wearable art robe. Like an original painting you can wear, this hand-screen printed kimono features exquisite, hand-printed flowers so vivid they almost look 3D against the deep black background. Wearing it, it's easy to imagine you woke up in the lush gardens of a monarch, and were adopted by the royal family. Designed and meticulously printed by expert Indian artisans, it makes a memorable wedding, bridesmaid, vacation, or spa gift for anyone who'd enjoy being relaxation royalty. Handmade from 100% cotton in India. Wash in gentle cycle. Do not bleach and do not dry clean. Use medium heat and low tumble dry. The fabric is of good quality, and the pattern is beautiful. This was a surprise gift for my sister. She really appreciated receiving it and wore it immediately after delivery. Bought this for my Teenage Granddaughter because she is really into the Japanese culture and this looked perfect for her. Received the item and it was not what I expected. It was so much thinner that I expected it to be, I could almost see through it. It's not worth the price in my opinion. One size does not fit all. Or close to all. Should not use this description for selling on line. Dimensions and sizes should be given. Length of back, circumferences at least. Unfair to customers, especially ones buying a gift. Had a very disappointed Mom. I bought this for myself to wear over thin sleep shirts, and it's perfect. The colors are bright and go with everything. The cotton is thin and lightweight but soft. Easy to wash and dry. Perfect for warm weather lounging.